Three deaths, 11 injuries and one missing were reported by the Faiez Serraj Tripoli Health Ministry (MoH) in Friday’s south Tripoli militia fighting. This brings the total since fighting started last Tuesday to 14 deaths (10 fighters, 3 civilians and 1 unknown), 60 injured (53 fighters, 7 civilians) and 2 missing. The MoH also reported that 211 families were helped to move out of the fighting zone. 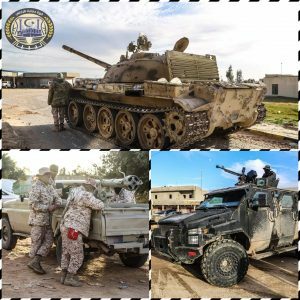 Fighting has subsided as the Faiez Serraj Presidency Council and Government of National Accord-aligned coalition of main Tripoli militias, the Tripoli Protection Force (TPF), claimed it has inflicted huge defeats on the Tarhuna-based 7th Infantry Kani Brigade in all fighting fronts. They claim the Tarhuna-based brigade were forced to flee south beyond Sbea towards Tarhuna. The TPF have also posted photographs proporting to have handed over security to local security forces in liberated areas in what they called a joint security operation.